One item that I see almost daily on Craigslist is vintage stereo cabinets. These pieces often get looked over because they may not work or look nice, and in the days of Spotify and Pandora the majority of people just aren't looking for a record player or gigantic radio. The good news is these forgotten pieces of furniture can be amazing when they are transformed. When I was pregnant with my first, this little beauty caught my eye and for $10 I couldn't pass it up. 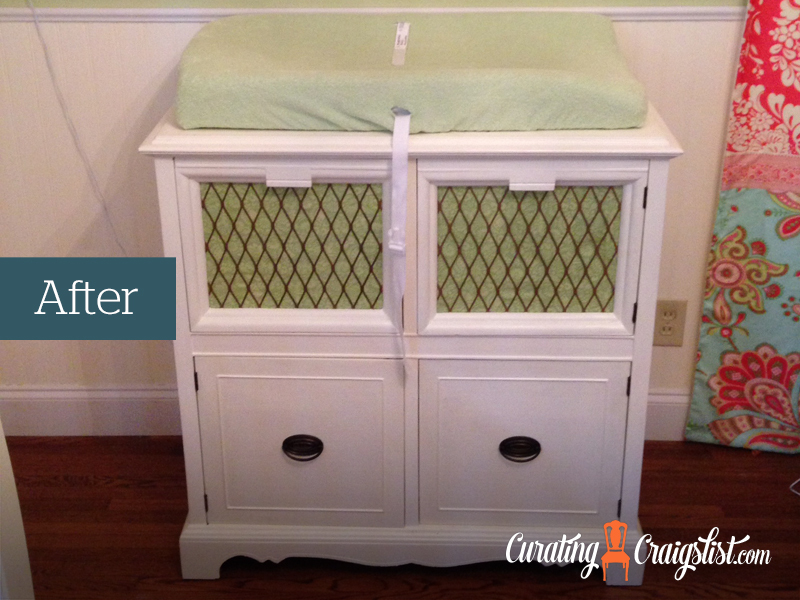 I knew immediately that it would be a perfect changing table. We took out the old radio components and painted the dresser off-white. We actually saved the components for other odd and end projects. We replaced the stereo fabric with new fabric that coordinated with the nursery. The addition of the fabric turned out to be on of my favorite parts of the finished piece. I also loved the original diamond pattern on the stereo cover, new pieces just don't have details like that. Next time you see an old stereo cabinet take a second look, with a little tlc it could be the perfect piece for your space. We'd love to feature more before and afters on the site. Send yours to curatingcraigslist@gmail.com. Posted on July 21, 2014 by Megan .